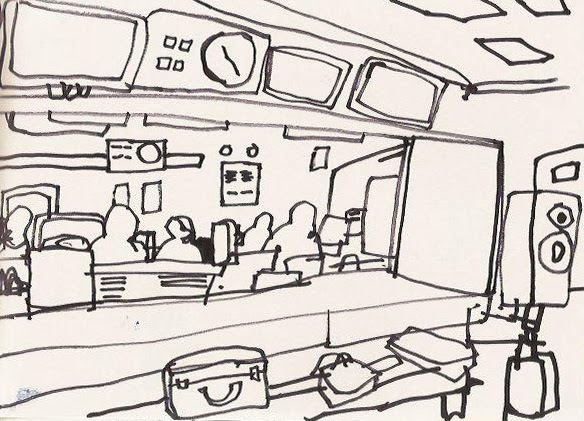 I was invited to BBC Broadcasting House in central London this weekend to take part in Radio 4's Saturday Live, to talk, along with Manchester-based artist Simone Ridyard, about urban sketching and the sketchcrawl phenomenon. It's an easy-going programme with live guests and prerecorded elements. Tracey Thorn of Everything But the Girl fame, environmental activist Laurens de Groot and I sat around the table with the presenters Richard Coles and Aasmah Mir for 90 minutes to be gently grilled. The time flew by, with chatter breaking out around the table every time we went to a prerecorded segment. And having a photographer looking over my shoulder as I drew was a bit distracting. 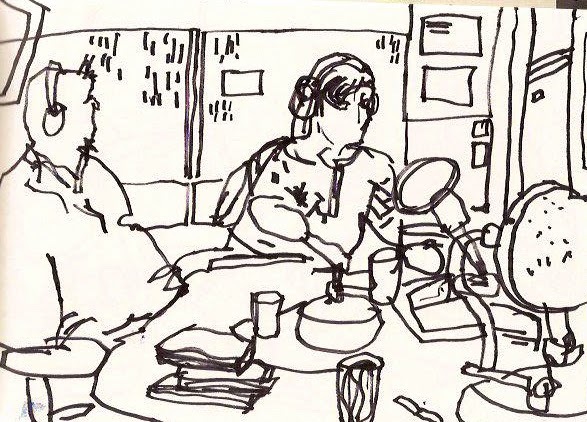 The hexagonal desk was a mass of paper cups, sketchbooks, microphones, clocks, monitors and unidentifiable bits of electronic stuff, through which the two presenters weaved their way as if it was nothing more than a chat around a kitchen table. There's a link to the programme here. 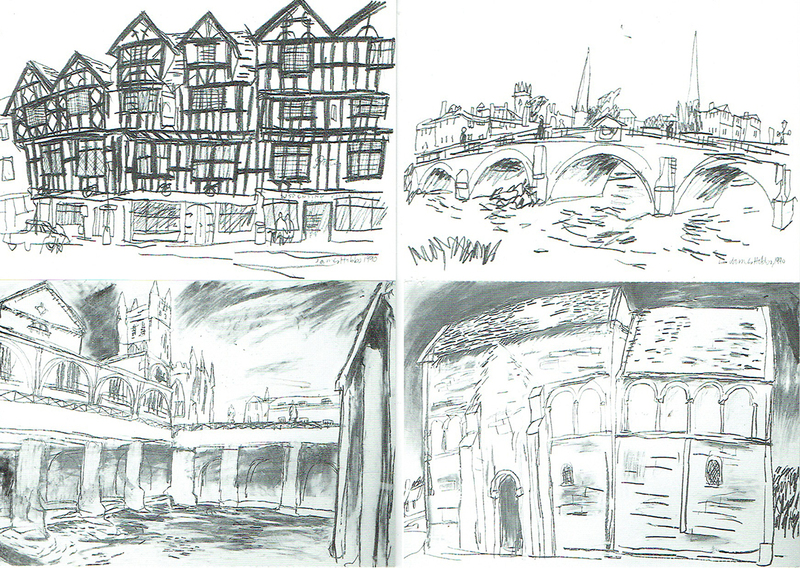 Look out for the gallery of work by London Urban Sketchers, too. BBC Radio 4: it's a beautiful thing. Did you hear Saturday Live on BBC Radio 4 today? 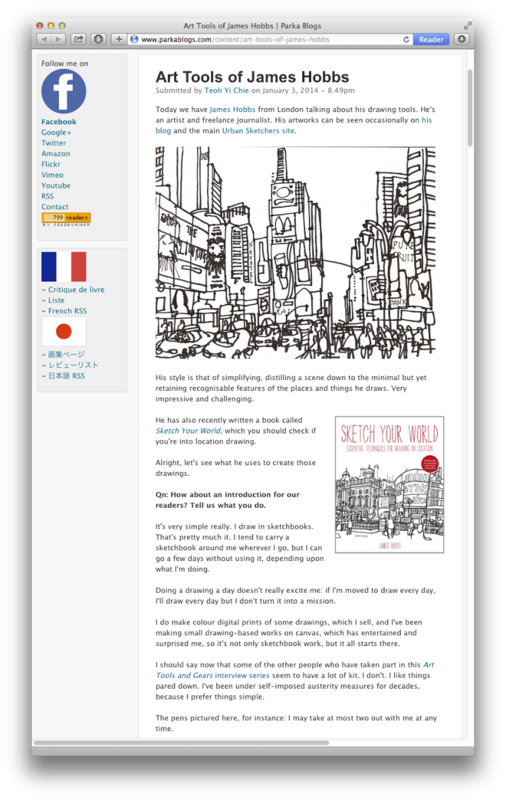 Simone Ridyard and I were interviewed about Urban Sketchers, and the joys of drawing together in sketchcrawls. • Oh, and there are more of my images on my Flickr site. That's definitely the last bullet point. I have a small selection of prints and drawings on sale in a display at Skylark Gallery 2, which is on the first floor of the distinctive Oxo Tower Wharf on London's South Bank, until 31 January. Guess what? 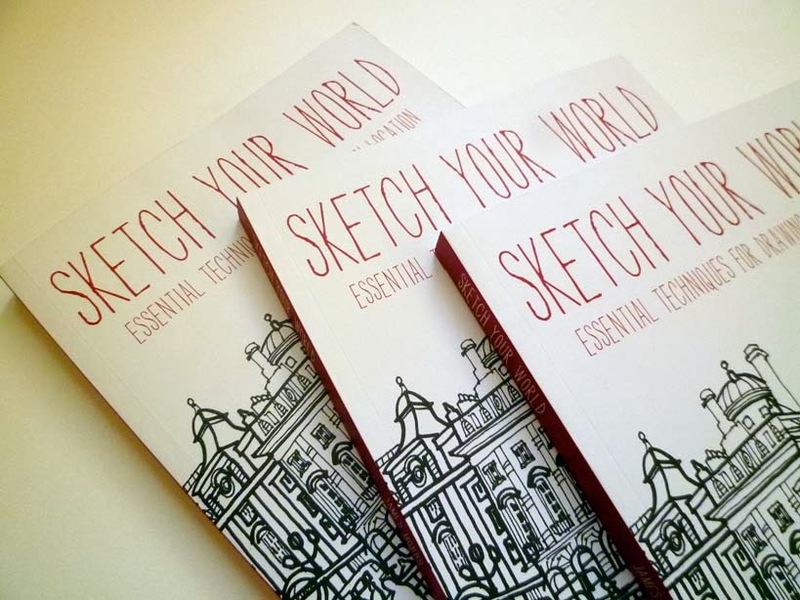 Signed copies of Sketch Your World are also on sale for £9.99. I will be at the gallery all day on Friday 31 January, when it will stay open until 8pm for a wine-fuelled book signing event — everyone is welcome. February will be, sadly, my last month at the artist-run space, at which I have been showing my work for the past five years. I'll miss it: but more about that later. Sketch Your World is published in the UK today. It's about drawing in sketchbooks, and includes the drawings and words of about 60 international artists who talk about how they go about it. Architects, reportage artists, students, journalists, illustrators, lecturers, retired people, Oscar-winning animators, people who squeeze drawing into lunch breaks and holidays... they are all here. It's published by Apple Press and costs £9.99. It comes out in the US later this month. There's more about it at www.facebook.com/sketchyourworld.